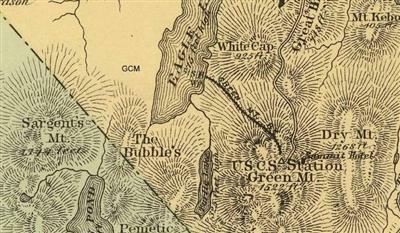 I have seen an old topo map of Cadillac mountain that shows a cog railroad going from Eagles Lake to the summit (1883). Does anyone have any info on this? Is the engine in any museum? I am interested since my family ancestors supposedly built it. 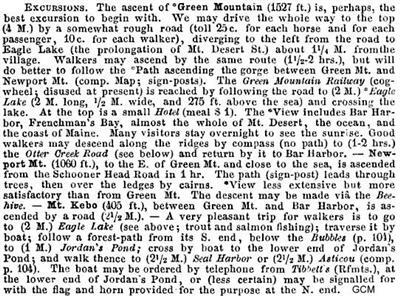 The Green Mountain Railroad ran from Eagle lake to the top of Green (now Cadillac) Mountain for a very few years. The 2 Cog locomotives were sold to the Mount Washington Cog Railway in New Hampshire around 1896. They work there today as #3 and #4, although very few if any original parts remain. The Green Mountain Cog Railway was a narrow gauge mountain railway built to carry tourists to the top of Green Mountain on Mt. Desert Island in Maine. At the end of the 19th. century, Maine's tourist industry was developing rapidly. 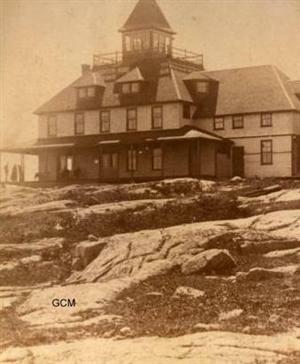 The islands off the coast of Maine were popular attractions and the possibility of a cog railway to the top of Green Mountain (now known as Cadillac Mountain) was first explored in the late 1870s following the success of the Mount Washington Cog Railway in New Hampshire. Construction of the railway started in 1883 and it was built to the designs in the Marsh patents developed for the Mount Washington line. The line operated during the summer season and for the first few years was successful. But tourist numbers declined and after the 1890 season the railway ceased operations. The railway's two steam locomotives were sold to the Mount Washington railway in 1895. Undaunted by this set back, Clergue began investigating other potential investment opportunities. He settled on the development of a tourist destination consisting of cog railway /luxury resort complex on Mount Desert Island. Clergue knew that tourists from Bar Harbor, Maine hired buckboards to drive up Green Mountain on Desert Island. 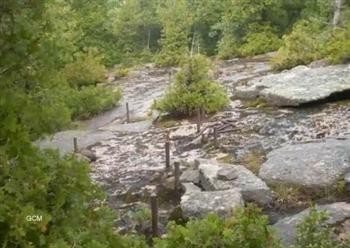 Tourists paid tolls to the owners of the carriage road and for the privilege of traveling to the top of the Mountain. Most stayed the night in the hotel at the summit or, at least, enjoyed a meal there before making the trip down to the base of the Mountain. Clergue's intention was to expand upon this foundation. He raised $100,000 from backers that he used to purchase both the existing hotel and two hundred acres along the side of the Mountain. He proposed to transport tourists to Mount Desert Island from Bar Harbor by way of a ferry and from Annapolis, Nova Scotia by way of steamship. In order to accommodate the tourists who made the trip, Clergue and his backers constructed the Bluffs Hotel at the shipping terminus. 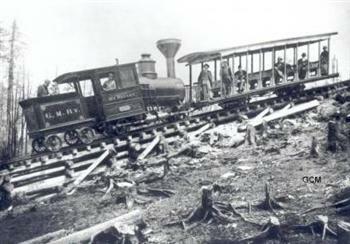 They began construction of a cog railway up the side of Green Mountain (now known as Cadillac Mountain) in February, 1883 after sliding a railway charter through the state legislature. It was substantially complete by April of that year enabling photographers to take the first publicity and advertising shots. They modernized the existing hotel thereby completing the first stage in the proposed development of Mount Desert Island. Clergue celebrated the formal opening of the resort on 23 June 1883 with a two day gala party. During its first year of operation tourists poured in spending money on everything from tickets to meals to lodgings. Revenues were sufficient for the company to pay a six per cent dividend in its first year. Fueled by this success, Clergue attempted to eliminate the competition created by the carriage road by dynamiting it. 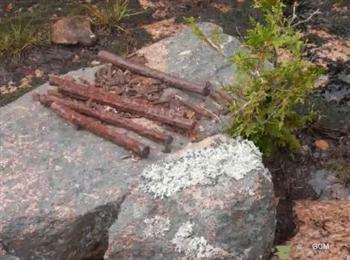 He then announced plans to construct an electric railroad in Bar Harbor. Summer residents were furious with his actions and cavalier attitude. They held a public hearing and subsequently hired former Vice President Hannibal Hamlin (the same man Clergue had applied to for employment several years before) to represent them legally. 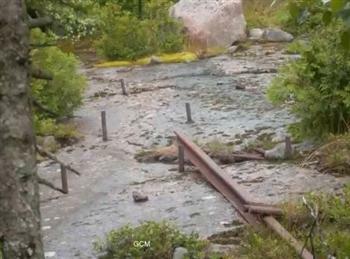 Clergue met his match in Hamlin and the railway was not constructed. As Bar Harbor became a year round community rather than merely a summer settlement, the tourist industry declined. The resort limped along for nine years after its first season. 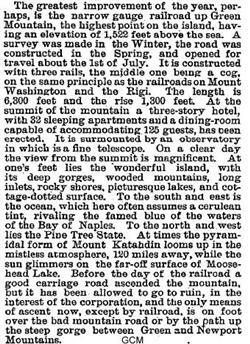 Finally, on 16 January 1893 the resort and all of its assets were sold at a sheriff's sale. The tracks were removed and sold for scrap and the engine ended up in New Hampshire.